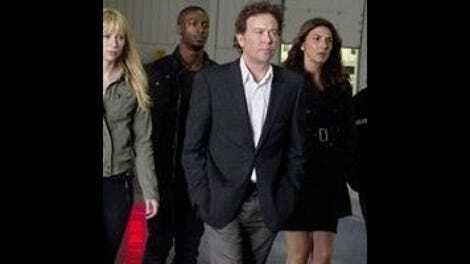 Leverage: "The Hot Potato Job"
And Parker finally got to do some fancy thieving in the climax, executing a basic-cable version of that thing where she, like Catherine Zeta-Jones in Entrapment and God knows who else I'm forgetting, got to do a gymnastics-ballet number in a room full of motion detector lasers. The sequence ended with her sliding on her knees out the door just as the room exploded behind her in a fireball. 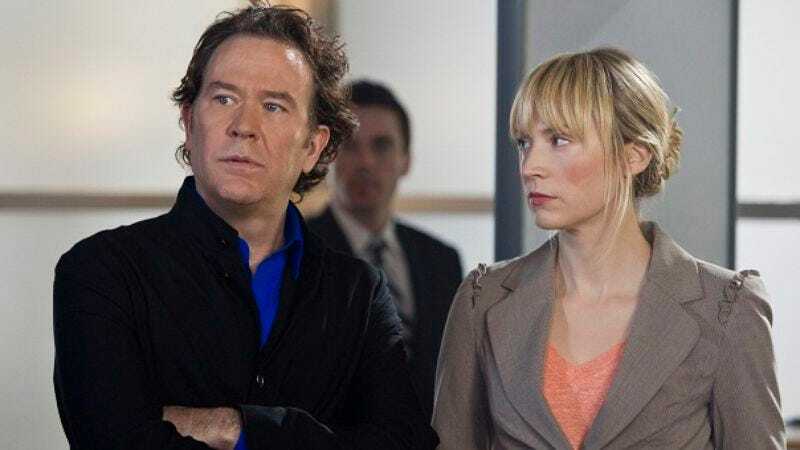 If Beth Riesgraf had even an inkling of just how sorry-looking the special effects surrounding her exertions would turn out to be, she deserves the Trouper of the Millennium Award. Bookended between these twin non-events, there was a lot of fun stuff. The episode opened on what looked like the front lawn of the producer's country home, though subsequent dialogue revealed that it was supposed to be a farm. Two bald guys in suits appeared and menaced the young woman living there: "You have something that belongs to us," one of them said in an unearthly monotone. I thought that I'd hit the wrong button on my remote and was catching up on Fringe by mistake. The threatened woman, a "crop science major", sought help from Nate and explained that, in her zeal to feed a hungry planet, she had dared to go where Oliver Wendell Douglas never dared and produced "a potato that has extra nutrients inside." She called it her "super-tuber", and was both alarmed and appalled that anyone could see it principally as a vehicle for making money—or a threat to their bottom line—in a world where "there are families that are living on less than a dollar a day." Impressed by both her skills and her argument, Hardison praised her as "a certified stone cold plant hacker" and assured his colleagues that "The super-tuber is no joke." Apparently his message failed to get through to the music department, which kept punching up whimsical-sounding melodies every time the Promethean spud was mentioned or sighted. The villain of the piece was an evil corporation called Verd Agra. I misheard that as "Big Agra" the first couple of times, which was probably the idea, unless I was supposed to mishear it as "Viagra" and giggle like Beavis and/or Butthead. The CEO of Verd Agra was played by Mitch Pileggi, which I'll admit got the X-Files geek in me pretty excited. Part of the excitement came from my deciding that his presence here was a sly acknowledgement that the most baroque elements of paranoid fantasy in the episode, such as the weird skinhead goons and the handsome Pulp Fiction-style briefcase in which they carefully placed the stolen tater were intended as a deliberate parody of the corporate-comspiracy sci-fi genre. If I'm wrong about that, I'd advise anyone working on the show who reads this to just pretend that I nailed it. It'll make both me and them look a little smarter. In order to infiltrate Big Agra, Sophie, thinking on her feet, jumped in and presented herself as a corporate sleuth with a peculiar accent. ("I'm not blond," she said at one point, which, though true, confused me as to its relevance. Then I figured out that what she had really meant to convey was that there was nothing wrong with her eyesight.) Apparently she was trying to sound as if she was imitating Christian Kane as Eliot, which was a funny idea even though she didn't. (With Sophie playing his part, Eliot was reduced to mugging a nerd and stealing his clothes so he could play Sophie's accountant. The whole point of this was, of course, to arrange it so that Eliot could whale on some guys while wearing what looked like the same pink shirt that once got Homer Simpson locked up with Michael Jackson.) There was also a winning, funny performance by Bhama Roget as the outwardly self-assured, inwardly insecure executive who Sophie played like a harp, a corporate iron lady with a soft caramel center. At the end, there was a faint hint that we may not have seen the last of Roget's character, and seeing her again would be fine with me. There was also the suggestion that this had something to do with the larger conspiracy that, the series keeps hinting this season, is taking shape behind the scenes. Based on what we've seen of it so far, that subplot doesn't even deserve to be called vaporous, even though we're already halfway through the season. On the other hand, it seems to be set in concrete that the schedule this season calls for one entertaining episode to be followed by a complete dud, then repeat. Does this mean that we can count on next week's episode to be a lethal snooze-fest? I hate to say that I kind of hope so, but then, if I liked surprises, I'd probably be watching a different show. "So the diamond is in the potato?"